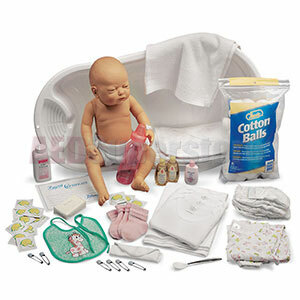 Ideal for teaching students or expectant parents the basics of baby care with the items in these kits. Each life-like female baby doll is 20" long with jointed arms and legs to allow for changing positions. The soft vinyl body is washable and may be submerged in water (drain water before storing). Each kit includes: one newborn white doll, one newborn black doll, tub for bathing, three cloth diapers, three disposable diapers, plastic pants, moist towelettes, diaper pins, baby gown, three undershirts, booties, baby bottle, baby spoon, soap, bib, shampoo, washcloth, towel, cotton balls, baby oil, baby lotion, baby powder, receiving blanket, and 20 baby care booklets.